Soil may be a natural filter that can act as a tertiary treatment for wastewater, preventing antibiotics from contaminating groundwater, according to researchers who conducted a study at Penn State's Living Filter. Researchers analyzed the fate and transport of three antibiotics important to human health—sulfamethoxazole, ofloxacin and trimethoprim—in soil and groundwater at the Living Filter, a 50-year-old wastewater reuse system that spray-irrigates treated effluent from the University Park campus' sewage treatment plant on 600 acres of farm and forest. In general, researchers found that each antibiotic behaved differently when exposed to the soil profile, but they gained insight into how soil might enhance wastewater treatment. Currently, most treated wastewater around the world is discharged by sewage treatment plants into rivers. However, most of those facilities are not capable of completely removing pharmaceuticals such as antibiotics. As a result, many rivers carry low levels of pharmaceuticals that are suspected of harming aquatic life. In waterways that provide drinking water, low levels of antibiotics may pose human health risks, contributing to the development of antibiotic resistance. An alternative to discharging treated wastewater into waterways and possibly contributing to antibiotic resistance and other ecological problems is to spray it on land, as Penn State has been doing for more than five decades at the Living Filter, noted Jack Watson, professor of soil physics and soil biogeochemistry. His research group in the University's College of Agricultural Sciences led the study. "With low-levels of antibiotics in the environment due to the release of wastewater treatment plant effluent into waterways, concern is rising about impacts on human health," he said. "Soil, due to its physical and chemical nature, in many cases could offer another level of treatment to remove antibiotics from treated wastewater. This study begins to evaluate the effectiveness of that concept." There are few facilities like Penn State's Living Filter in the eastern U.S., but wastewater reuse to provide irrigation water and to recharge aquifers is a common practice in the arid American West and in the deserts of the Middle East, pointed out lead researcher Alison Franklin, a doctoral student in soil science and biogeochemistry. Franklin collected soil samples at a site on the Living Filter that had not received irrigation for seven months, and then at the same site following one irrigation event and again after 10 weeks of irrigation. Franklin also took groundwater samples three times a year over five years to capture seasonal variability. The researchers typically found sulfamethoxazole at the highest concentrations in wastewater treatment plant effluent with ofloxacin and trimethoprim at lower concentrations. In the soil, ofloxacin was present at the highest concentrations after seven months without irrigation, but sulfamethoxazole did not reach concentrations higher than ofloxacin until after effluent was continuously applied. Trimethoprim was only detected in soil following 10 weeks of effluent irrigation. These results suggest that ofloxacin may remain in the soil for long periods of time, Franklin explained, while sulfamethoxazole and trimethoprim may not remain after effluent irrigations stop. 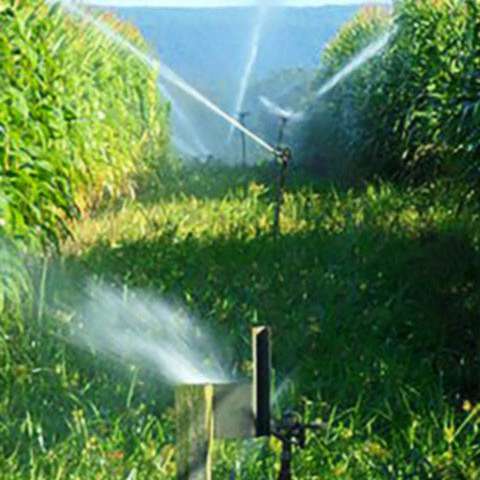 Groundwater concentrations were typically much lower than soil or wastewater effluent concentrations with only sulfamethoxazole being found consistently. 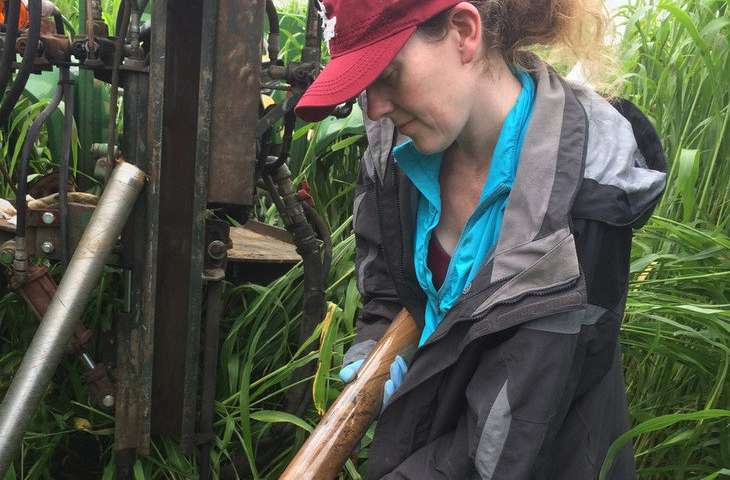 "Given that antibiotics interacted with the soil profile and groundwater concentrations were frequently more than a 1,000-fold lower than effluent, the soil profile appears to be an adequate tertiary treatment for wastewater treatment plant effluent," she said. "That would lead to improved water quality and protection of human health." The findings of the research, which were published today, Sept.10, in the Journal of Environmental Quality, are important, Franklin believes, because they suggest that land application of treated wastewater in some cases may present a cost-efficient way for wastewater treatment plants to be upgraded to remove antibiotics and perhaps other emerging contaminants, too, from their effluents. That could be critical, Franklin believes, if the government decides to set water-quality standards for antibiotics and other pharmaceuticals. "There is a lot of research looking at what can be done at wastewater treatment plants to improve their capabilities to remove emerging contaminants—but the solutions are expensive to implement and may be under 100 percent effective," she said. "So, our work suggests that, especially with water shortages, we could reuse water and purify it as it goes down into the soil profile before it reaches the groundwater system." All soil profiles cannot prevent antibiotics from reaching groundwater, Franklin conceded, so it would depend on the soil quality and type. 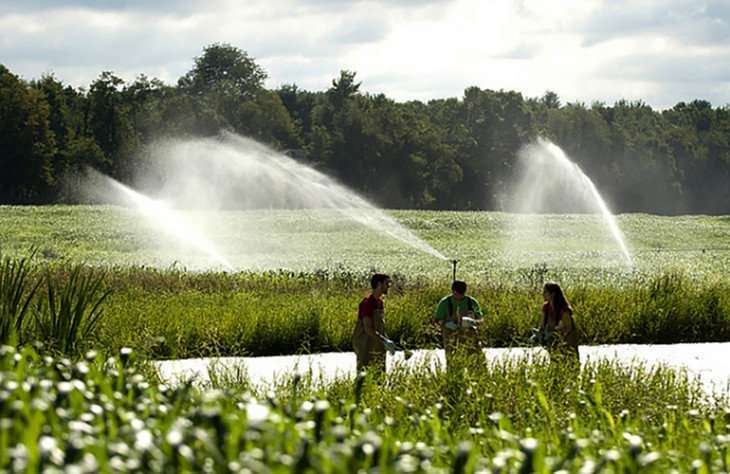 But these findings suggest that, in places, land application of treated wastewater—as is done at Penn State—could prove to be an economical way to remove antibiotics from treated wastewater. "Perhaps some wastewater treatment plants don't have to be completely revamped," said Franklin. "Maybe they can be retrofitted to reuse the water by spraying treated wastewater on land." Soil is full of all kinds of microbes. The antibiotics will have unforeseen consequences.